An unfamiliar Real Madrid side downed Leganes 4-2 at the Estadio Municipal de Butarque on Wednesday to move back ahead of Barcelona into top spot in La Liga. A madcap opening half saw Real cruise into a 3-0 lead through James Rodriguez's strike and an Alvaro Morata double before Leganes pair Gabriel and Luciano cut the deficit to just one. Martin Mantovani's own goal just after the break eased the pressure on Real, and although they continued to look vulnerable, Los Blancos eventually earned all three points against their Madrid rivals. Barca's easy 3-0 win over Sevilla earlier on Wednesday had briefly seen Real pushed into second in the league standings. Leganes looked robust in the first 15 minutes, but then a moment of brilliance from Marco Asensio opened the hosts up to create the first goal. The 21-year-old Spaniard intercepted the ball on the halfway line and drove to the six-yard box past two defenders before squaring for James to tap the ball into an open net. Three minutes later, Morata headed his first from the back post, looping the ball home from a very tight angle after Nacho nodded on a corner. It looked as though the game was done barely halfway through the first 45 minutes. But Real's young side then relaxed too much and Leganes started to carve out opportunities. Excellent work from Diego Rico down the left result in Gabriel poking home the hosts' first after a cut-back in the 32nd minute. And two minutes later, the comeback was well and truly on as Luciano reacted fastest in the box to a poor knockdown from Sergio Ramos—Nacho was also culpable for needlessly playing the Brazilian forward onside. Los Blancos restored a two-goal cushion just three minutes after the break. Asensio cleverly drew a free-kick on the edge of the box and James' delivery was deflected home for an own goal by Mantovani's outstretched hands. Real continued to look sloppy, though, and it was not until Zidane called for reinforcements late on—Luka Modric and Isco were both thrown on—that they finally regained control. It was a spirited performance from Leganes, who provided a tougher test for Real than many would have expected, but Zidane's men eventually eased back to the top of the table with a win. inedine Zidane has been consistent in his approach towards Colombian star James Rodriguez, the Frenchman has always insisted that he would like him to stay, however ever-more-regular outbursts have left Real Madrid without a leg to stand on while trying to move him on for a big fee.On Wednesday night against Leganes, the 25-year-old showed what he could do with his feet and scored the opening goal in a hectic first half of action, but upon his substitution in the second half he made no attempt to hide his frustrations as he was replaced by Isco. Upon returning to the bench, which has been a regular home for the Colombia international for the last season and a half, he lashed out angrily. Unfortunately, this is just the latest in a catalogue of incidents which suggest that James' relationship with Real Madrid is turning into an unhappy one - and it has effects on his international duty too. "James is my friend and I love him a lot," ex-player and compatriot Tino Asprilla explained to ESPN Deportes last year. "But I can see that his friendship with Cristiano Ronaldo at Real Madrid is damaging him. He now does the same gestures as Ronaldo when he doesn't get the ball. "Ronaldo makes gestures at everyone when he doesn't get the ball and James is doing the same with Colombia. James needs to improve with his teammates because he is playing in a team with many youngsters, and nobody stands up to him. "In another team, he would get a slap. In my team nobody would have stood for it. "Earlier in the season against Sporting CP in the Champions League, James sat grumpily on the bench and didn't even endeavour to warm up. Allegations in the media suggest that he perhaps isn't the same player that arrived from AS Monaco, down to the lifestyle which he now leads in Madrid.The attacking midfielder has featured in just 752 minutes in LaLiga this season, while racking up 311 in the Champions League, showing just where he lands in Zidane's first-team plans. Given the exhaustive schedule that Los Blancos have had to play, James very much finds himself as a second-string option.While James complains, makes statements in the media about his desire to fight for his place and fumes on the sidelines, Isco provides the example for what his teammate should be doing. The Spain international gives similar soundbites to the media, but then goes about the task at hand with a quiet diligence. There are no signs of insolence, occasional natural frustration maybe, but James doesn't need to look too far from home to figure out how he should conduct himself.The 25-year-old's form hasn't been enough to dictate that he gets a starting role for Real Madrid, nor does their system directly house his favoured position. In a battle which is already downhill, he is only making it harder for himself - and the club. Many external observers can look at the fact that James hasn't played as much as he would like this season and attribute his attitude to that. It is certain that there will be many potential suitors if he becomes available to leave Estadio Santiago Bernabeu in the summer.However, these outbursts and signs of immaturity add an element of doubt into the mix. If you purchase James Rodriguez, undoubtedly you have a talent on your hands, but since the 2014 World Cup he has since taken on additional baggage for a new coach to deal with.Nobody should be bigger than the squad itself, but at Real Madrid the Colombian finds himself in a dressing room full of stars and other big egos. Elsewhere, James could either knuckle down and enjoy first-team football, or escalate his current behaviour due to being a big fish in a smaller pond.Should he stay, Zidane has a talented player to call upon that apparently wants to prove his worth. Should he go, his antics may mean that Real Madrid might not be able to command the fee that he is truly worth. 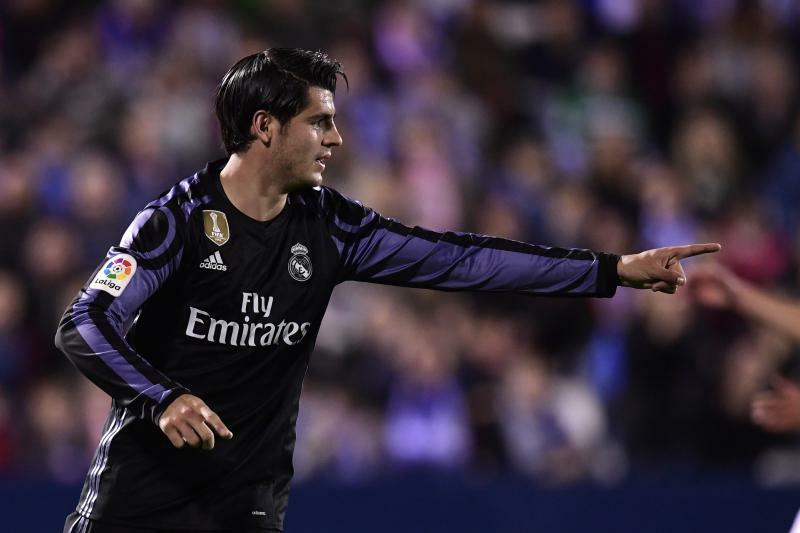 0 Response to "Leganes v Real Madrid: Morata scores hat-trick"